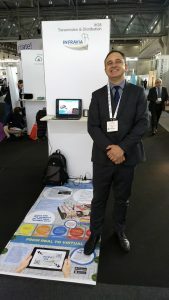 The startup Catarinense Infravia is Participating of European Utility Week, up to Thursday, in Viena. Today, 6, the CEO Aloísio Pereira da Silva gave a lecture at the event. At the event fair is on display an interactive rug that shows the Infravia system -That Organizes the networks of energy, telecommunications, gas, water, sewage and urban drainage in underground trenchs installed under public walks – Through augmented reality application. Developed by the Senai Innovation Center, Infravia AR allows Holographic visualization of underground infrastructure networks, indicating the precise location of pipes, valves, cables and other public utility objects. This application facilitates identification of network problems, need for repairs and even maintenance work. European Utility Week is considered a platform for business, innovation, networking and information in the area of infrastructure. It gathers 12000 visitors from 100 countries, 2000 infrastructure concessionaires and 600 exhibitors, including Infravia. Next week, Infravia participates in the Smart City Expo World Congress in Barcelona.